Say goodbye to corrosive products! The good news is that more and more people no longer want to use harsh, toxic chemicals to clean their homes. Yet, the drain cleaners that most people keep under the sink are extremely strong and harmful, both for the environment and for the skin, because they are very corrosive. It is, however, not true that to take on a tough and dirty task we MUST use a harsh product to do it well; natural solutions do exist! Here are 5 natural ways to unclog your pipes! 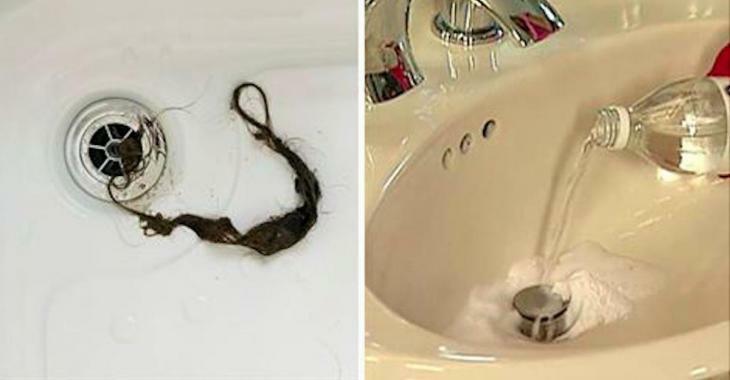 This trick is effective at cleaning the dirt that clings to the inside of the drain. Just pour 1/2 cup (125 ml) of baking soda and 1/2 cup (125 ml) of vinegar into the drain. Then pour 4 cups (1 liter) of boiling water over the mixture. These products break down the fat in your drain and the water removes the remaining particles. Easy and natural! If the sink in your bathroom is slowly emptying, there may be a build-up of soap and grease inside. Just as with baking soda and vinegar, pour 1/2 cup (125 g) of salt and then pour in boiling water. Salt is like a scrubber that scrapes all the grease, hair and grime from your pipes! This trick is designed to be tough on grease, but gentle on the skin. It's the perfect product to clean your pipes with! If you want to be totally eco-friendly, there are cleaning products that use live enzymes to erode dirt. Like dish soap, these products dissolve greasy and hairy dirt/debris that is blocking your pipes. Ask for cleansers with live enzymes at your local hardware store, such as Biokleen and Earth Enzymes. Sometimes the only way to clean a blocked pipe is to use our own elbow grease! Maybe you just have to work smarter, not harder. Installing a drain basket or screen at the top of your drain will prevent dirt from accumulating.